Early Morning Run: Peanut Butter & Co. Giveaway!! Peanut Butter & Co. Giveaway!! Wow!! I can't believe the Early Morning Run pack is over 100 strong!! It's pretty surreal for me to think that there are over 100 people reading what I write. Thank you so much for the time you take out of your days to see what I've written and to contribute! Truthfully, I'd probably still be writing even if only a few people were reading, but you all make it so much more fun! Please keep commenting: sharing your ideas, tips, and experiences. That's what the blogsphere is all about! To celebrate this milestone, I want to do something for all of you awesome people by offering a pretty great (at least I think so) givewaway!! I'm very excited about this one! The cool people over at Peanut Butter & Co sent me a few of their new squeeze packs to try out! 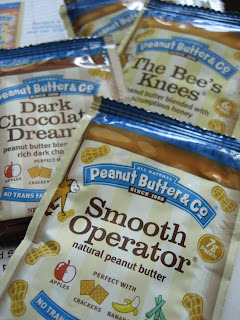 This is one of their newest products, aimed to help PB-lovers everywhere enjoy their favorite PB&Co flavors on the go! Lee Zalben, Peanut Butter & Co President and Founder, says about these squeeze packs: "Everyone knows that peanut butter is a delicious way to get prtein and energy into your diet. But having a jar of peanut butter on hand after a workout, a race, or even in a long car trip isn't always convenient. Our new squeeze packs are perfect for stashing in a purse, tote bag or lunchbox, and turn wholegrain crackers, celery sticks, apples, and bananas into nutritionally balanced, whole food snacks." Aren't these cute?! Aside from loving the actual peanut butter, I love PB&Co. branding. For now, these new squeeze packs come in only three of the ten flavors (but what great flavors they are! ): Smooth Operator, Bee's Knees, and Dark Chocolate Dreams. Each pack is 1.5oz (2tbs) each and they come in boxes of 10 (one flavor). Seriously convenient for fueling on the go! I took one pack with me on a trip recently so I could get my PB fix away from home, and enjoyed Bee's Knees in my oats this morning! Yum! Also, if you haven't heard, PB&Co. is supporting athletes in other ways too, as the title sponsor of the TWENTY12 Women's Pro Cycling Team, which is managed by Nicola Cranmer and Kristin Armstrong. On a green note, PB & Co. is also working towards lowering it's carbon footprint by partnering with Terracycle on these squeeze packs by creating the Peanut Butter Brigade. Terracycle will turn used squeeze packs into tote bags! Check out Terracycle's website for more info about their innovative company. 1 squeeze pack of each flavor plus 1 jar of PB & Co peanut butter, you choose the flavor! Super important: Leave a separate comment for each entry!! Thanks! 1. Tell me what your favorite PB&Co flavor is, or what flavor you'd love to try. 5. Post your favorite way to eat peanut butter! 7. Post this giveaway on your blog and leave a link in the comments. Giveaway ends: Friday, May 14th at 8:00pm! full disclosure: Peanut Butter & Co has provided me with the squeeze packs for review, I'm adding the jar of PB on my own dime. Fav way to eat pb? On a spoon! Saw this place on Travel Channel. What a concept! I'd most like to try the Bees Knees flavor though if they ever introduced a coffee chocolate flavor, I would be highly interested! I follow you and really like the way you keep me connected to the Big Apple. I'm now following you on Twitter though I am a bad Twitterer. I also follow PBC now on Twitter. My favorite way to eat PB is on a hot English Muffin. Ciao! What an AMAZING giveaway!!! Dark Chocolate Dreams is definitely my favorite! But I also love the Cinnamon Raisin - it makes a great dip for apples. I love their products! My favorite is the maple almond butter. I'll post on my blog. I seriously want to try the White Chocolate Wonderful. My husband and I were just eying these cute packages yesterday. Dark Chocolate Dreams sounds like heaven in a jar! Seriously, peanut butter and dark chocolate is such a good treat! Oh and I already follow your blog! My favorite way to eat peanut butter is out of the jar! So those squeeze packs would be perfect for me! My favorite flavor is the cinnamon raisin swirl. I would LOVE to try the Bee's Knees. My favorite way to eat peanut butter is with apple slices...or with a banana....or with honey....or on a PB&J sandwich....and MOST definately with chocolate! And my fav way to enjoy PB & Co is on a spoon! I haven't tried the dark chocolate yet, so I would be all over that! I love being a follower! I'm a purist, my favorite way to eat PB is off a spoon! I love PB on a graham cracker. oooo I have never heard of PB&Co, but I would love to try the chocolate one!! I love love love peanut butter and chocolate together!!! My fav is white chocolate wonderful. Just delish!!!! I follow both you and peanutbutter&co on twitter. I love peanut butter, I love it in an open faced PBJ with strawberry preserves ( I eat this 99% of my lunches) I also love it on a banana. My favorite flavor of ice cream is Hagan Daas peanut butter and chocolate. mmmmmmmm! i want to try crunch time! I follow this blog on Bloglines. fav way to eat peanut butter: on organic whole wheat bread!!! I follow your tweets too! I love peanut butter on celery! i tweeted the line "Win this giveaway"
I follow PB&Co on twitter. 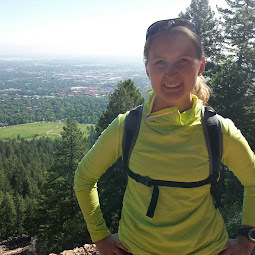 You to top billing in my blog post today! i would go with The Bees Knees and not just because i dig the name. another i wouldn't mind indulging in would be Dark Chocolate Dreams. yummy. I'd like to try the Bees Knees b/c I love anything with honey! My fav way to eat peanut butter is on a toast with honey drizzled on top. Favorite: Smooth Operator & Cinnamon Raisin Swirl. PB in hot cereal or on waffles is tops. Have posted about this on Twitter (@MasPublicHealth). And the best way to eat PB is licking it off a spoon straight out of the jar! I want to try Dark Chocolate Dreams! I never have, and it bugs me. Annnnd you were already in my Google reader. I love to mix peanut butter with plain yogurt, frozen berries, grape nuts and cinnamon and leave overnight for a yummy breakfast in the morning!! I've linked to you on my sidebar! Popped in from SITS! I wish I'd known about those when I flew to NO this weekend! My favorite way to eat PB is 1 TBSP pb with 1/2 cup kashi go lean and 1/2 a banana! I'm a follower of you but have never tried or even heard of PB&Co before this morning. I'd love to try it, but am a little fearful of how addictive it sounds. I LOVE, LOVE, LOVE peanut butter and Uncle Marv and I have switched over entirely to natural only. But I'm willing to sacrifice my principles to taste Dark Chocolate Dreams. Favorite ways to eat PB? Well, added to a S'more would have to be top of the list, but how often does one have a chance to do S'mores? On celery or just off a spoon is probably when I'm more apt to eat it. Yum! Guess I'll have to run down right now for a fix!! dark chocolate dreams is my favorite :) fun giveaway ! fave way to eat PB - with a spoon out of the jar! Congrats on having over 100 followers - that's awesome! I love your updates and posts. 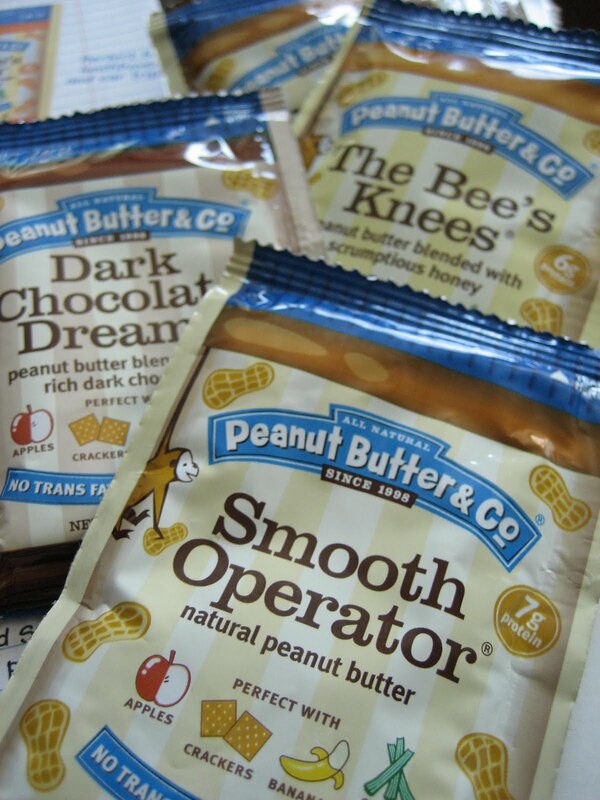 Love the names of the peanut butters! They seem very convenient! PB and Nutella on a tortilla with a quarter banana all wrapped up. I forgot to post that I follow you via my google reader as well. I really want to try the Bee's Knees or mightly maple flavors! Or just regular crunchy pb! I'd love to try "the bees knees"!! I love honey! Though I'm a brand new follower of your blog, I am a follower!! My favorite way to eat peanut butter is on wild rice pancakes, with maple syrup! my friend chris lives in the city & goes to columbia. he regularly sings the high-praises of peanut butter & co. that dark chocolate variety looks superb!! I'm loving the cinnamon raisin!! my favorite way to eat pb is with apples and carrots!! I'd love to try the "bee's knees" pb! Favorite way to eat pb is a toss-up between straight from the jar and spread on a banana. Both are delish. I'd love to try Dark Chocolate Dreams or Mighty Maple ... yummmmm! I love to add my peanut butter to my oats in the morning, along with yogurt and bananas and chia seeds and cinnamon. I posted the giveaway on my Twitter. I would love to try The Bee's Knees - PB with honey! My favorite way to eat Peanut Butter - on a BLT. Grew up eating them this way and when I ordered one in a restaurant as an adult, and it had MAYO - I thought I was going to be sick. BLT with PB is the only way to go! And hey! I'm following you on Twitter. In a totally non-stalky way. Dark Chocolate Dreams is my fav. Of course! Chocolate, peanut butter, what's not to love?? I LOVE PB on my oatmeal! Classic! Never got to try PB&Co so don't know favourite flavour but all sound very yummy! Ahhh...their new minis are sooo cute. I heart Bee Knee's! I follow PB&Co on Twitter! I've never tried any PB & Co! I am dying to though!! I love Dark Chocolate Dreams! Its amazing. I would love to try The Bees Knees! I love the maple flavor! I tried a Mighty Maple sample once, months ago, and I can almost still taste it... it was that good! MMM. Cinnamon Raisin is my favorite, but they're all SO GOOD! i don't know how to "follow" your blog, but I just discovered it and will be "following" in my own way - by checking back all the time :). on another note, i'm a run buddy at the gotrm race, so maybe i will meet you there! My favorite way to eat peanut butter is between two slices of really delicious, hearty, fresh, multigrain bread -- perhaps with a banana inside, too. My second favorite way to eat peanut butter is in a smoothie. i just tweeted about the giveaway! all out of entries now. fingers crossed :). thanks!